Feeling nostalgic at the beginning of the New Year, well just the sight of this pencil sharpener will bring back memories of school days past, that curiosity and slight fear you felt the first time you put your pencil through the opening into the sharpener. What about the first time you emptied one and found an avalanche of shavings? Funny thing about this style of pencil sharpener is that sharpeners with this same basic design can still be found in schools, generations after the first Automatic Pencil Sharpener Company (APSCO) pencil sharpeners appeared at the beginning of the twentieth century. This Dexter Model 3 Pencil Sharpener was manufactured by APSCO sometime around 1945 introducing improvements. There were two versions of this sharpener differentiated mainly by materials, coloring, and the logo. In the late 1940’s APSCO rebranded and standardized it’s styling, logo, and even colors used on all of their sharpeners and by 1953 the second version of the No. 3 was the only one available for sale. By design, the sharpener is an upright, oblong metal container which is curved at the top and bottom. The cover of the lower section collects wood and lead shavings, and is made from transparent cellulose, an early twentieth-century plastic. Emblazoned on this section is the model name and the APSCO logo. Attached to the right side is a crank handle for turning the two spiral cut blades and on the left a gear-like wheel that rotates to accommodate various width pencils. The four holes on the corners of the base allow the unit to be screwed onto a flat surface. The overall aesthetic is similar to a fishing reel used to draw in fishing line. 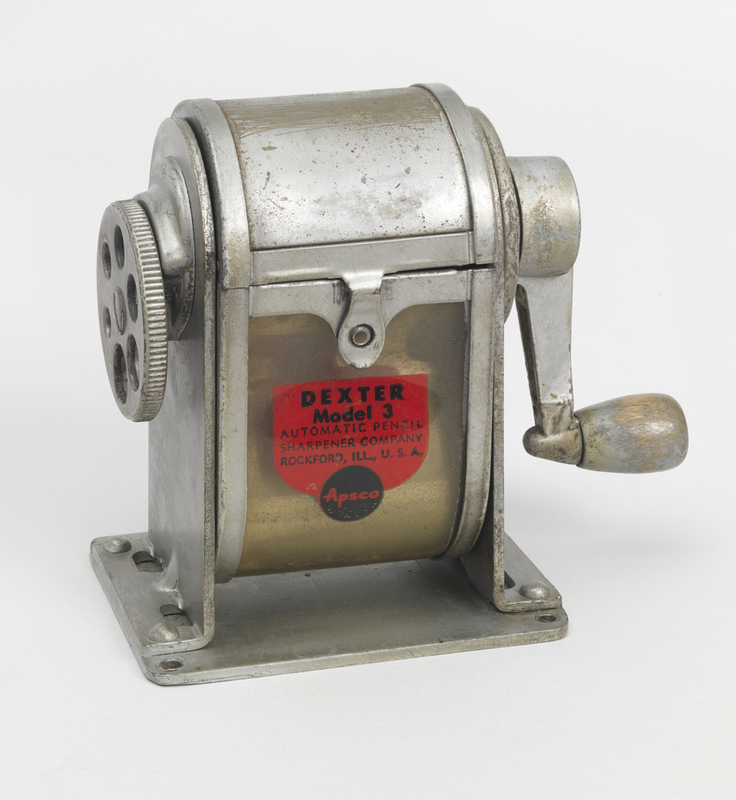 The original model of the Dexter sharpener was first introduced in 1914 and was available through 1928. That model only allowed for one size pencil, so, between 1928 and 1933 the Dexter sharpener was improved and re-launched, the later models including the rotating wheel with calibrated openings for various pencil sizes. By the 1920s APSCO was making a dozen similar pencil sharpeners, each with its own style and price point. They were sold under such names as Chicago, Giant, Wizard, Gem and Junior in addition to Dexter. APSCO also advertised widely, pointing to the convenience, cleanliness, efficiency and monetary value of using a pencil sharpener over a pen knife for sharpening needs. Success of this product is probably due to designer Chuck Spengler’s simplest design of using two replaceable milling cutters of manufactured from tool steel and a detachable metallic or transparent chip casing. This straightforward design would influence most of the mechanical sharpeners made during the next half century. Although all the selling points are valid, burgeoning sales records could be attributed to the $1.00 price tag. Although a leader of the mechanical pencil industry, APSCO (later APSCO Products, Inc.) was never able to compete in the electric pencil sharpener market. The company that had made the iconic sharpening tool was becoming obsolete by the 1970s and 80s. Yet this vestige of simpler times and astute engineering remains in many a classroom as a token of past greatness. I have this sharpener. It works fantastic! It was on my grandfather’s back porch since I was in elementary school at least, possibly used my my aunt who is ten years older than I am. The top cover has crumbled away but otherwise intact.